Miscelleneous imporatnt setup and environment related activities. The error seem to be confusing to end users as the user have x86 (32 bit) hardware config , OS also 32 bit and finally the downloaded OBIEE version also 32 bit (x86) .So above error is bit misleading . I have search on OTN forum and the outcome seems not to be so promising ,it might be the problem for other users could be helped by the suggestions . For my case the resolution for the problem is : Copy the file systeminfo.exe from path “C:\WINDOWS\system32” of any Windows XP Professional version and paste it to the same path at XP Home .pretty simple ! only thing is that you need to have another machine where XP Prof version is running or could be downloaded . Now try to execute the file systeminfo.exe from Run . Make sure that : “C:\Windows\system32” is set in your PATH environment variable. It would run in a command window and faded after glimpse . 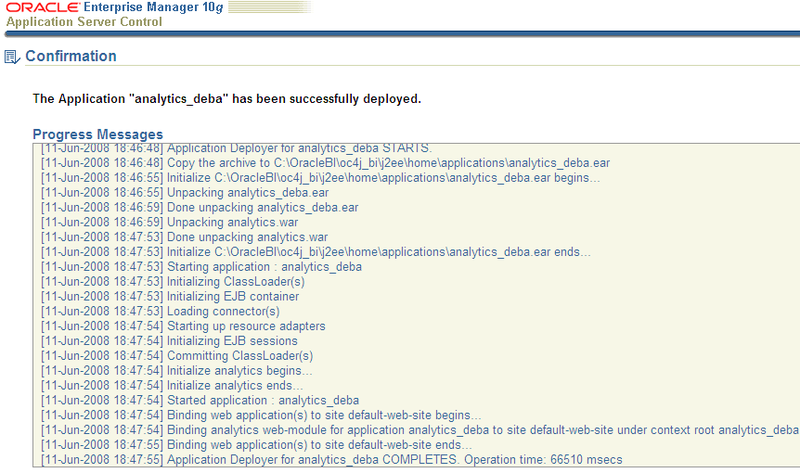 Don’t worry … Now try to reboot your machine and see if the OBIEE installer works fine or not . Note that this one is very specific problem reported for Dell Laptop users .Alternatively you can run the WMI diagnostic utility from Microsoft or de-install “Broadcom ASF Management Application” from Add/Remove option which is reported to be a known culprit for the problem . 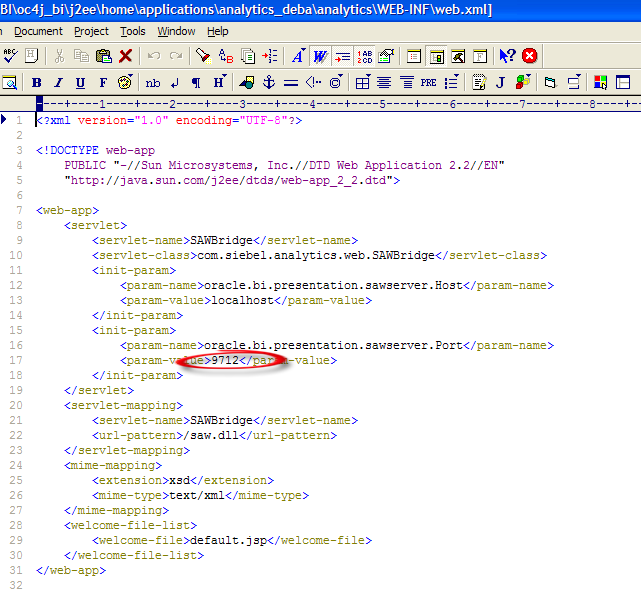 Future expected version : OBIEE 11g (Negril) – A Major and Mega blockbuster release . Thanks Darryn for the above inputs . Luckily I got a chance to get work on a BI Clustered Environment on behalf of a giant UK Customer .The situation demands a clustered shared repository and load balanced environment so that BI Server resource would be shared across multiple server and the consecutive request from loads of users will be distributed without being a lack of memory or a memory dump . As the application was so big that it could have to process million of request in a day hence the idea was to have a clustered shared BI server env . In addition to that there was multiple BI Presentation server was there .Since OBIEE still not have a active failover mechanism (until incorporated using DMZ network and deployed inside a failover Router) so we have gone for a passive failover mechanism where at any time one Presentation server will be used and absorb the request transmitted from Browser and another will be in hot standby mode and will be used in case of the Primary Presentation server stop response . 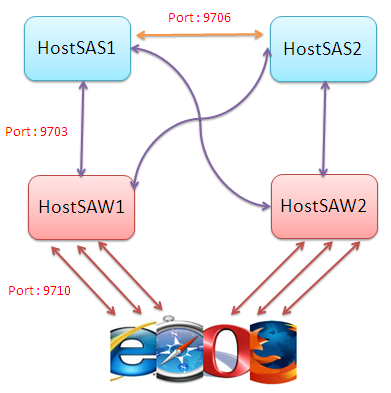 So lets make situation bit simple : We have “HostSAS1” and “HostSAS2” act as two BI Clustered Analytics Server and “HostSAW1” and “HostSAW2” act as two BI Web Server .At any time two SAW server can pass the request to any of the SAS server and depending on the load the BI Cluster controller module will redirect the request and process it by using any of the Analytics Server resource . 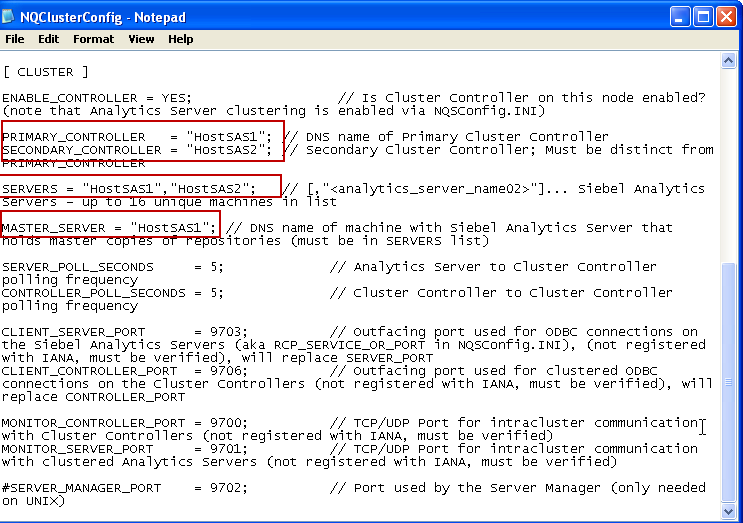 Hence “HostSAS1” and “HostSAS2” need only BI server components and Cluster controller installed and configured ,whereas “HostSAW1” and “HostSAW2” needs only Web server component installed .Since both SAS1 and SAS2 are only configured for single BI instance having single default DSN “AnalyticsWeb” hence to configure BI Clustering we need to configure those DSN’s in both server as below. Please note that we need to make atleast one server as Primary . Hence our case SAS1 has been made as primary . 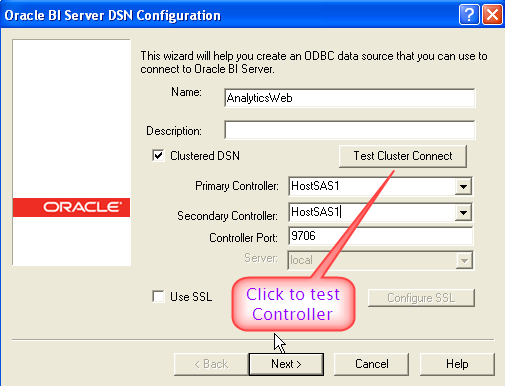 After that make the Oracle BI Server and BI Clustered Controller Service up and running and Click “Test Clustered Connect” option . 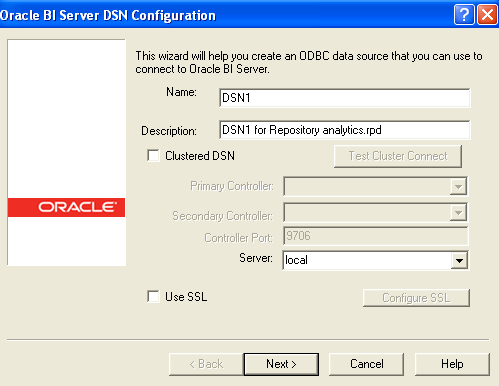 This should throw a successful clustered connection message .That means the BI Cluster controller now actively participating and can handshaking with two BI Server services using Clustered ODBC connection port 9706 . BI Server Clustering is definitely a scalable solution by which we can tie multiple server together to handle the loads of inbound requests and thus perform a good load balancing and load sharing across them . 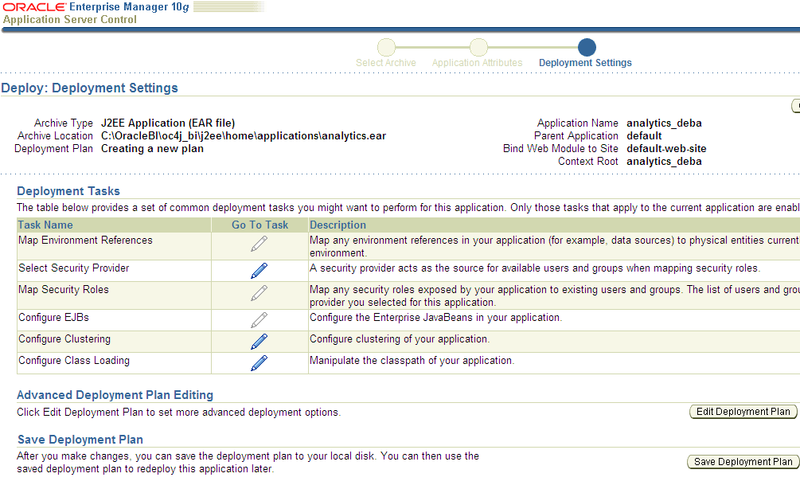 This also enhance the BI server response and inturn the performance . However there are couple of issues observed during the application/RPD syncronisation process during polling time window .One of the known problem is ,while you are doing online RPD editing from either Primary or Seconday server and save the RPD it would restart the BI server and copy the changed RPD and syncronised it across 2 servers .Thus ,eventually it make the consistency and integrity but if any user try to access report in between sometime it would throw errors as the BI server is restarting . Moreover , Before restarting the BI Server during the cluster sync process the RPD usually copied into a separate location of Log .But after syncronisation it doesn’t delete the RPD from Log file location . So best practice is to remove that RPD from log after service down or making the services up in clustered environment .Otherwise if you try to put a fresh RPD in Primary server it could have been replaced and syncronised by previous RPD from log file and necessarily incur some inconsistent behavior and wrong results .Believe me this is my observation while working Online in Clustered env . This is not a Cons rather a restriction which seems logically correct .What will about your Cache Files while you env is Clustered ? As we know Cache files must be build inside individual BI Server location as separate physical files and since that location is not shared across BI multiple servers .Hence to perform the Caching in Clustered environment, the physical location for storing and sharing cache entries need to be specified using parameter “GLOBAL_CACHE_STORAGE_PATH” under NQSCONFIG.ini file .Also it is worth to monitoring nQCluster.log from “..\OracleBI_HOME\server\Log”, if Clustering is enabled . N.B : – To operate clustering perfectly follow the Cluster and OBAS (Analytics Server) startup sequence judiciously i.e Primary OBAS up , Seconday OBAS up , Cluster Controller of Primary up and then Secondary Controller up . I was suddenly experimenting with the RPD file name syntax and came to know that some special character in .rpd file name will not be recognized by BI Server service and hence putting character like “$,#,%,<space>,-” inside the filename will throw below error in NQServer.log file and you will get below error message after Windows service startup . Syntax error in NQSConfig.ini file. 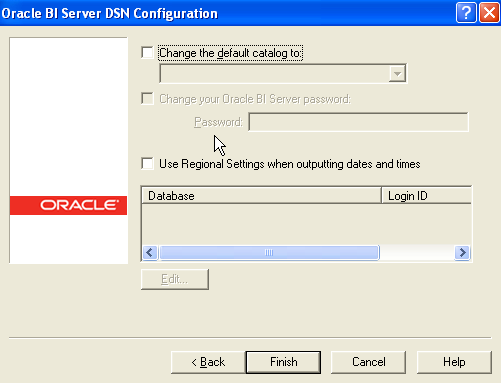 [nQSError: 26009] File D:\OracleBI\server\Config\NQSConfig.INI Near Line 33, Near <“>: new line in string. One of our current assignment was to do the online development using one RPD from one platform say Windows and also need to do the testing of the different RPD hosted into different IBM AIX platform. Since AIX doesn’t support the GUI kind of stuff hence we have configured both the RPD in Windows env via multiple DSN configuration . It’s pretty simple , easy and straightforward though need to cautious about some syntax . 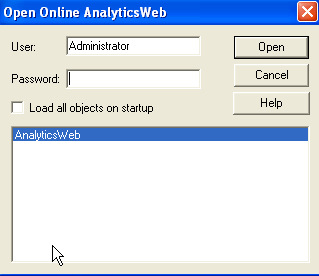 As we know OBIEE installation do a default configuration of “AnalyticsWeb” System DSN (i.e Oracle BI Server Driver NQSODBC.dll) which appeared in a box while developer try to open the RPD in *Online Mode* . However developer can simultaneously work with multiple RPD online where RPD’s even hosted under heterogenous platform .Only thing you need to know is that the IP address or Host name and the Port by which a SQL ODBC connection done between BI Presentation server and BI server(usually the default port is 9703 until customized and configured ) . So lets create a new System DSN . 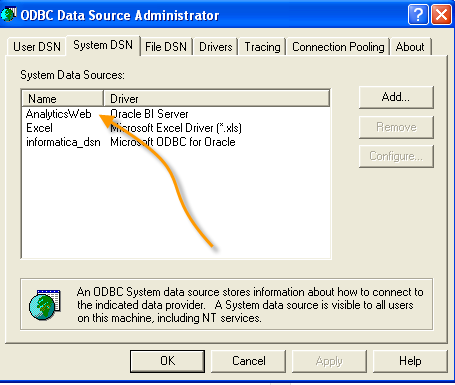 Click Add on System DSN tab from Microsoft ODBC Datasource Administrator window . 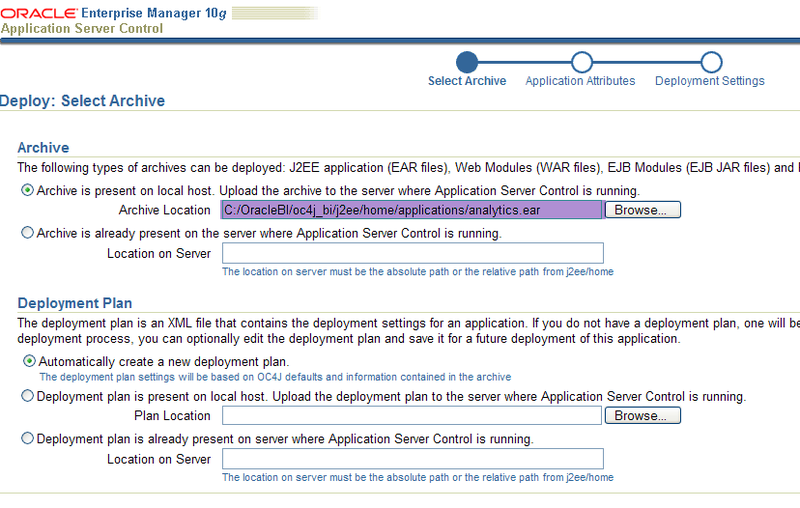 Select the driver as “Oracle BI Server” .Click Finish . Then go through the below steps . Here I have created a DSN called “Sample Scott” and let the other settings unchanged apart from Server “AIX_Server” .Before that make sure you able to ping that server from your local machine by running “ping AIX_Server” from command prompt .Otherwise you can put the AIX host IP address .Sometime you might need to map the hostname and IP address in “..\WINDOWS\system32\drivers\etc\hosts” file . 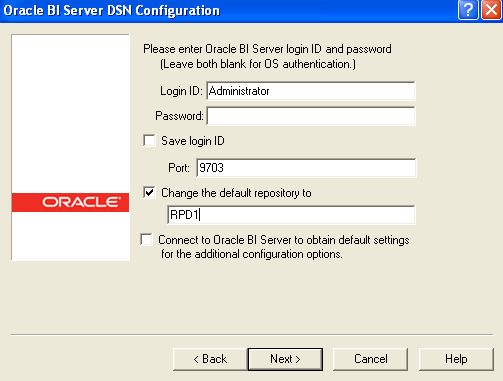 If explicit login ID and password required to access Oracle BI Server from other environment (apart from OS authentucation) enter the Login ID and password for the same and change the port if necessary .Since I am not physically loading multiple RPD from my own BI server(physically 2 separate BI server running instance load that RPD into their memory) hence keep uncheck Default repository Catalog” . Make sure the AIX server reachable and SAW service working fine there once running the SAWPING utility from $ORACLEBIHOME\web\bin . It should return the response as : “Server alive and well” . 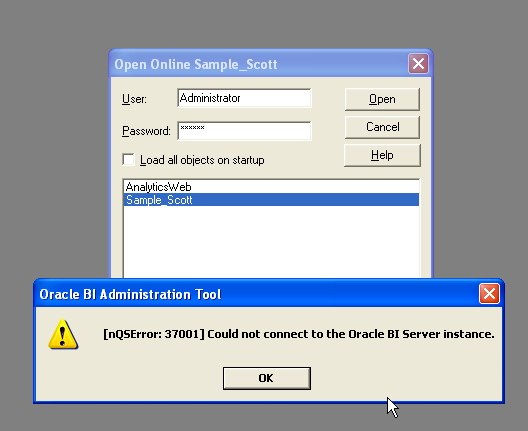 This utility try to access Oracle BI Presentation Server services to lookup whether this could communicate with Oracle BI Server via 9703 port . Trying to access “Sample_Scott” with proper password will throw the below error though my BI server instance running on AIX machine . Can you identify what is the problem behind this ? 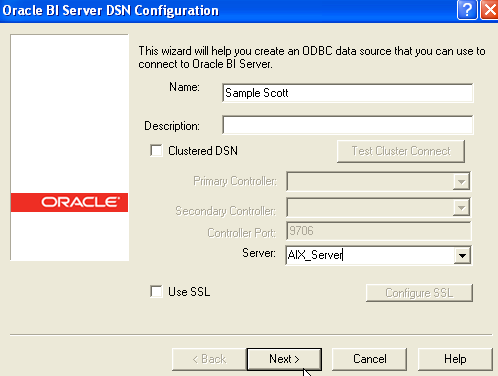 The problem is BI server try to find a DSN called “Sample_Scott” whereas the actual DSN name is “Sample Scott” . 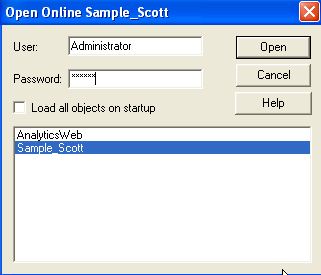 Now lets change the DSN name to “Sample_Scott” and here you go ! there is no more problem . 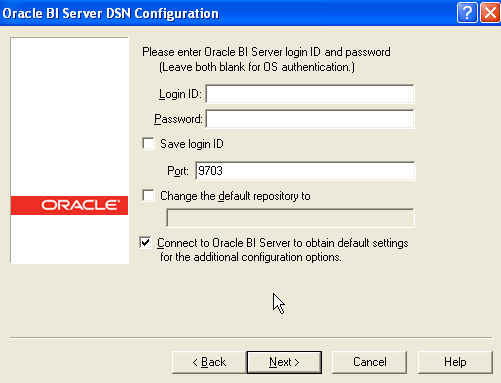 So in brief BI server doesn’t support the DSN having space between them . This is al about the syntactical caution we need to consider .